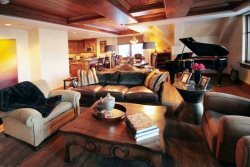 Wonderful 1 bedroom, 1 bath condominium located in the heart of Vail Village and directly on the Gore Creek. Easy walk to ski slopes, Bridge Street, restaurants and nightlife. One free outdoor parking space located directly in front of unit. The property has many features including a gas fireplace, dry sauna, wireless internet, 2 flat screen T.V.s, game area and games for children, sleeper sofa, 2 recliners, ski locker just outside the condo, fully stocked kitchen (sorry, no dishwasher), nice private deck. Please note that the bathroom has a shower, but no tub. The shower has been freshly re-grouted the fall of 2011! Guests staying at this property also have free unlimited access to the Aria Club & Spa. The Aria Club and Spa is located adjacent to the Cascade hotel off of South Frontage Road. The facility boasts over 78,000 square feet and is Vail's most extensive workout facility & spa- unprecedented for its professional approach to fitness and personal wellness. Offering fitness classes, personal training, Pilates, cardio and weight-training equipment, an indoor track, indoor basketball court, indoor tennis courts, racquetball, squash, heated outdoor swimming pool and hot tubs, the Aria Spa & Club takes fitness to the ultimate level. (There is an additioanl fee for classes and tennis). Guests also receive 10% off spa treatments M-Th before 2 P.M.
as fireplace, dry sauna, wireless internet, 2 flat screen T.V.s, game area and games for children, sleeper sofa, 2 recliners, ski locker just outside the condo, fully stocked kitchen (sorry, no dishwasher), nice private deck. Please note that the bathroom has a shower, but no tub. The shower has been freshly re-grouted the fall of 2011!